The Inca Empire on and around the shores of Lake Titicaca Bolivia to its historical centre in Peru. We start in a region called the Altiplano, a place where the Andes are the widest and a city that is set in a canyon created by a river. La Paz Bolivia is the highest (administrative seat of government) capital city in the world at 3650m (11,975ft). The Empire Roads tour starts at the top of the earth and takes us from here, to the Yunga’s forests (1000m) of Bolivia and Peru, the shores of the largest body of water in South America, Lake Titicaca, and to Cusco Peru the historical centre of the Incan Empire and the Sacred Valley of the Inca’s, eventually leading to an unbelievable finish at one of the seven wonders of the world, the amazing ancient Inca City of Machu Picchu. Join us for this life changing trip, blended with amazing sight seeing side trips that will amaze and enlighten you. While riding through some of the most beautiful, stunning and challenging roads in the Bolivian and Peruvian Andes. 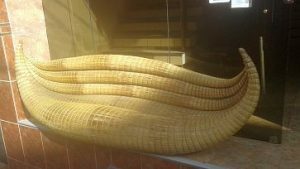 This 34 day tour is a combination of our Sky roads and Inca roads tour, and includes 3 extra days including a 2 Day/1 Night visit and tour to the floating islands on Lake Titicaca Peru. Yes you can bring your non riding partner to Bolivia and Peru. To enjoy all of the non riding sight seeing, excursions and tourism, with additional guided tours in select locations as they join us to follow you on this tour. 34 Days/33 Nights – Rider Price: $6900 USD Per Person (everything included) – NON Rider Price: $4600 USD Per Person (everything included) – Fitness Level: Intermediate (you currently ride or can ride 200k a week with ease) – Group Size: 4 rider minimum, 12 rider maximum This tour has so much variety, Road cycling, Hiking, Kayaking and Mountain Biking. 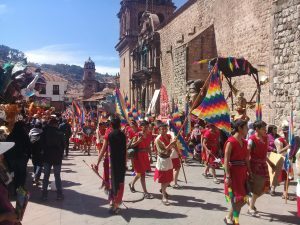 This June Tour is during the Festival of the Sun Inca Inti Raymi Celebration month in Cusco. Note about fitness levels: All riders receive a (minimum 8 week) training program for the tours. If you are currently a beginner level rider (100k per week), but want to do this Intermediate fitness level tour. As long as you make a commitment to train to prepare and get to the (200k per week) level we are happy to have you join us on this tour. 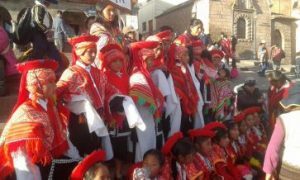 Sight seeing and visiting central La Paz, Bolivia, the Markets, Churches and Museums. Descending and ascending the New Yunga’s road (the 4th longest paved climb in the world). Staying a night in the Tropical Andes Bolivian Yunga’s forest region at 1000m. Staying 2 nights in an Eco Oasis in a small valley village at the foot of a 6300m peak. Riding around part of Lake Titicaca. Two nights in Copacabana, Bolivia. 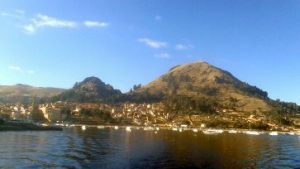 A boat trip on Lake Titicaca, visiting and hiking the Island of the Sun and Island of the Moon (Bolivian side). Visiting the ancient site of Tiwanuku. In Peru: Sight seeing the World Heritage City of Cusco, Peru the historic center of the Inca Empire (including 2 walking tours). Staying a night in a Cloud Forest Bird watching Lodge. 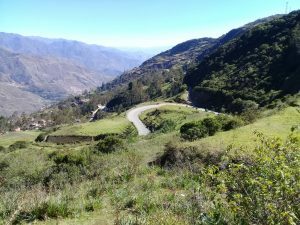 Bolivia and Peru: 22 Riding days for 1158k (52k per day average) including the majestic La Cumbre La Paz, La Cumbre Sorata, Abra Malaga and Abra Lares). Visiting Machu Picchu, the incredible ancient Inca Citadel. This is a high altitude cycling trip and its important to spend some days to acclimate. So we have 4 days in and around La Paz to do this. The first few days are sight seeing with guided tours of the city, then we begin to move a bit more and have 2 short riding days outside of El Alto so you ease into more activity. When we transfer to Peru (Cusco) you have some days to relax before the second part of the tour begins. Sight seeing La Paz and guided tours of the markets and downtown. First real riding day of the tour. 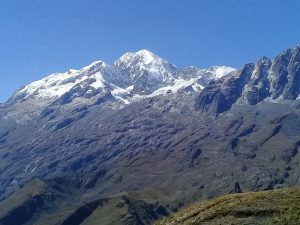 La Paz to Yolosita (Yunga’s region). We start with a little climbing followed by an incredible long valley descent. We visit La Senda Verde wildlife sanctuary in the afternoon. Tonight we stay in an authentic Bolivian Yungas village. Back to La Paz. This first climbing part is optional we transfer and then continue to ride the climb up this stunning valley to the majestic La Paz La Cumbre. This by our research and calculations is the 4th longest paved climb in the world. We ride the top easier 45% of this total climb. Tonight we stay in the city. We start the day with a transfer for 1.5hrs. From here we ride across the Altiplano then climb 10k to the Sorata La Cumbre and descend on a stunning road 30k to the base of the spectacular Cordillera Real (Royal) mountains. Tonight we stay in the small mountain village of Sorata at an amazing Eco Lodge Oasis at 2600m. Today we drive high into the mountains and hike to a small high country lake, with stunning views all the way. In the afternoon we relax. Tonight we stay again in Sorata. 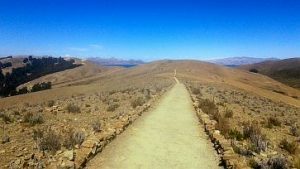 We climb out of the valley until we reach the peninsula with amazing views of Lake Titicaca for almost the whole day. Tonight we stay on the lake. A stunning day riding. We ride some more of the peninsula, then take a short boat trip across this part of the Lake Titicaca. Then ride over 2 passes the highest being 4255m with breath taking views for over a 100k in all directions of the area to then descend down to Lake Titicaca. Tonight we stay in Copacabana. Not a complete rest day. We rent Kayaks and paddle out onto Lake Titicaca early in the morning. Then take a boat trip to the Island of the Moon where we hike the for an hour and then re-board the boat to visit Island of the Sun and hike some more. Tonight we stay in Copacabana. We start early In the morning from with a 11k climb and then descend back to Tiquina on the lake. Then we transfer to visit the ancient site of Tiwanuku. Tonight we stay in La Paz. Day 14: Non riding day – Transfer to Copacabana. Transfer to Lake Titicaca and relax, Tonight we stay in Copacabana. 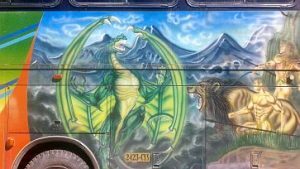 Day 15: Non riding day – Transfer to Puno, Peru. Transfer to Bolivia/Peru border and continue on to stay in Puno, Peru tonight. 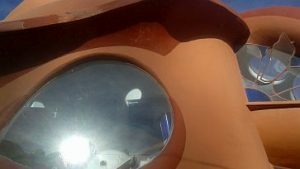 Day 16: Non riding day – Day and Night on Lake Titicaca. Trip to floating islands, stay the night with family on one of the Floating Islands. Return to Puno by boat in the morning. Then Transfer from Puno to Cusco. Check into the Hotel and relax. Welcome meeting and tour introduction with our guides, build our bikes and relax. Free time. Sight seeing around Cusco with walking and guided tours of the city, downtown and ancient ruins. Sight seeing and walking tours. Bike body fit check and Climbing/Descending/Cornering class and briefing. Short ride 2hrs. Sight seeing/Guided tour/free time. Short ride. First real riding day of the tour. We leave Cusco climbing out of the city and descend to the Sacred valley. Tonight we stay in Pisaq. Leaving the village we follow the Urubamba river valley for 25k then climb towards the sky. Breathe taking views of the valley below. A transfer to where we stay in a cloud forest lodge. A transfer to begin. We start at 3719m this morning. Today’s course features 2 climbs the highest a 10k to 4255m plus 35k of descending. This is the high country with amazing views of Ausengate Mountain in the distance. This Inter-oceanic road that will eventually connect Peru to Brazil and the Atlantic ocean. We stay tonight in Ocongate. Leaving Ocongate 3520m we have 2 climbs today, the highest a 4193m pass followed by an amazing decent of 20k to the valley floor. Tonight we stay Oropesa in the valley. A flat easy day back along the stunning river valley with a climb to the Pisaq ruins (optional) to finish. 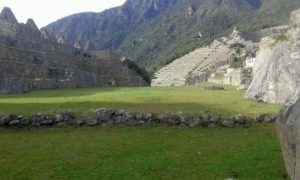 We have a guided tour of the ancient Inca ruins here and later explore the famous traditional market. Tonight we stay in Pisaq. We start with a flat warm up 15k ride in the Sacred valley and then turn to climb 34k into the mountains to the Legendary Abra Lares 4461m. There are 3 days that perhaps define this tour, this is the first. A long 25k descent brings us to this small mountain village town of Lares. We soak in the hot springs and relax for the afternoon. Tonight we stay in Lares. This is a split ride day with a transfer in between. Today is the second day that defines this tour. The scenery will continue from yesterday to blow your mind.To begin a long 20k descent into a completely different environment. River canyons and valleys. Then turn to climb for 1hr. We then transfer up the valley, have a stop for lunch. Then remount to climb for 1hr the last part of Amazing Abra Amparaes 4568m. What follows is 33k of descending and pure fun! Tonight we stay in Calca. An active rest day with a easy mostly slightly downhill 20k ride. 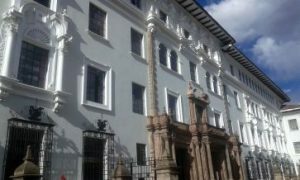 We stop to visit the Museo Inkariy and then continue onto the Sacred valley town of Urubamba for an authentic Peruvian Lunch. This afternoon we have a guided tour of the Maras Salt Mines and Moray. Tonight we stay in Urubamba . Another active rest day with a easy mostly downhill 20k ride with a few easy rollers to Ollantaytambo. This afternoon we have a guided tour of the ancient Inca ruins here. Tonight we stay in Ollantaytambo. The last riding day of the tour. Today is the day that perhaps defines this tour. In the morning we start from Ollantaytambo at 2840m and begin the majestic 37k climb up the Abra Malaga 4316m. The views will be etched in your memory forever, as will the 77k descent (yes that’s not a typo) into the jungle region of Santa Maria 1051m. Tonight we stay in an new Eco Lodge just outside Santa Maria. We awake to morning song. Then transfer to the amazing Santa Teresa hot springs to swim and relax. 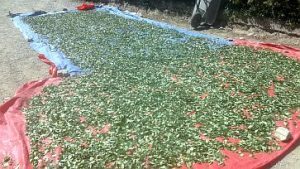 Transfer a little more to the Hydroelectric where we take lunch then walk the beautiful picturesque flat 11ks (2hrs approx) along the river and railway line to the Machupicchu village of Aquas Calientes. Tonight we stay in Aquas Calientes. Considered one of the 7 wonders of the world. This day we spend visiting the breathe taking Citadel of the Incas, Machu Picchu. We are guided for 2.5hrs then are free to explore for another 3hrs perhaps walking to the Sungate, or climbing Machu picchu mountain. We then say goodbye to this incredible place in the afternoon and take the train to Ollantaytambo. Transfer back to Cusco for a Farewell dinner party. Tonight we stay in Cusco. Morning in Cusco. Pack bikes and transfer to airport or other transport. Death Road MTB day mountain bike hire fee and guides. Guided Tours of La Paz City, Tour of Markets and Museums, Teleferico Tour. Visit to La Senda Verde Wildlife Sanctuary entrance tickets/donation. Lake Titicaca boat trip to Island of the Sun and Moon/entrance fees (Bolivia). Lake Titicaca boat trip and overnight stay on the floating Islands (Peru). Guided Tour of the Tiwanuku Ancient Ruins/Tickets. The close off date to book with a deposit is March 24th 2019 for the May 23rd – June 25th Tour. A $1000 USD deposit is due within 7 days of you receiving the booking/payment information from us. The deposit confirms your spot on the tour. This tour is for Intermediate and Advanced fitness riders only, NOT for recreational cyclists. You have a road bike and you ride it regularly. All riders are requested and expected to follow the training program to prepare for this tour. We want you to come on this tour prepared so you will enjoy it more. You must be able to easily ride multiple back to back 200k weeks before you get to Bolivia. Full tour payment is due 1 Month before the Tour starts. Photo credits: Antonio ‘alitas’ Juan.